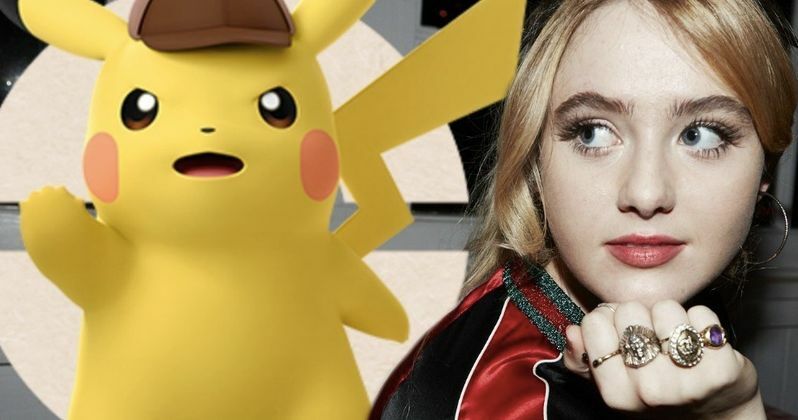 Legendary's Detective Pikachu has finally found its female lead, with Big Little Lies star Kathryn Newton entering talks with the studio. This comes just two weeks after Justice Smith signed on as the male lead, and with production reportedly set to begin in January 2018, there will likely be a flurry of casting announcements coming in the near future. It remains unclear how many more major roles will need to be filled, but the title character is by far the biggest. Last month, an unconfirmed report revealed that the producers want to lock down an A-List action star to voice Detective Pikachu, with the four names on Legendary's "wish list" said to be Dwayne "The Rock" Johnson, Hugh Jackman, Ryan Reynolds and Mark Wahlberg. Unfortunately, no story details have been given, and there are no details about who either Kathryn Newton or Justice Smith will play, or how they may be connected to Detective Pikachu. It's possible that their character are both tied to law enforcement, thereby working with the title character, but we won't get any confirmation until the studio releases some official story details. We first heard about a Pokemon live action movie back in July 2016, when massively popular mobile game Pokemon Go was sweeping the nation. Upon launch of the Pokemon Go app, it added a whopping $9 billion in revenue for Nintendo, even though they only own a one-third share of the Pokemon company. The report claimed Legendary was trying to act fast and put together a Pokemon movie, with early rumors claiming that Max Landis (Chronicle) was writing the screenplay, but it seems he's no longer involved in this iteration. While there was talk that the live-action movie wouldn't happen, just a few days later, this Detective Pikachu movie was announced. The movie is based on the Detective Pikachu video game, which was first released in Japan in early 2016. The game follows a strange, talking Pikachu who is not as strong or powerful as other Pickachu's, but does possesses higher intelligence and claims to be a stellar detective. He meets a young boy named Tim Goodman, who can actually understand what Detective Pikachu is saying, which leads them to travelling all over the city, solving crimes together. This Detective Pikachu adaptation will be written by Nicole Perlman (Guardians of the Galaxy) and Alex Hirsch (Gravity Falls). Director Rob Letterman joined the project exactly one year ago today, working from Nicole Perlman and Alex Hirsch's script, with filming set to begin in London in late January 2018. Pokemon celebrated its 20th Anniversary last year, which kicked off with a special Super Bowl commercial that lead to the launch of the Pokemon Go app. There have been more than 279 million Pokemon video games sold worldwide, 21.5 billion TCG cards shipped to 74 countries, with an animated series spanning 19 seasons, making Pokémon one of the most successful entertainment brands in the world. Variety broke the news on Kathryn Newton, who played Reese Witherspoon's daughter, Abigail Carlson, on HBO's Big Little Lies. She can also be seen on the big screen in two indie hits, Three Billboards Outside Ebbing, Missouri and Lady Bird, and she will also star in the Supernatural spin-off Wayward Sisters.